This article is about the Catholic University of Leuven before its split in 1968. For the current Dutch-speaking university in the city of Leuven, Belgium, see Katholieke Universiteit Leuven. For the French-speaking counterpart in Louvain-la-Neuve, see Université catholique de Louvain. Pope Gregory XVI, cofounder with the bishops of Belgium of the Catholic University of Malines in 1834, which would later be the Catholic University of Leuven. The Catholic University of Leuven (of Louvain in French, and historically in English), located in the town of Leuven, was considered the largest, oldest and most prominent university in Belgium. 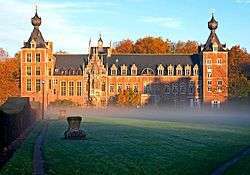 The University of Leuven was founded in 1425 by John IV, Duke of Brabant and approved by a Papal bull of Pope Martin V. It flourished for hundreds of years as the most prominent university in what would become Belgium, and one of the more prominent in Europe. During the French rule over Belgium in the French Revolutionary Wars, the French Republic closed the university in 1797. After Belgium was joined to the United Kingdom of the Netherlands, the State University of Louvain was founded in 1816, lasting until 1835. In 1834, a few years after Belgium had gained its independence, the separate Catholic University of Mechelen was founded. This new Roman Catholic university moved its seat to Leuven and took the name "Catholic University of Leuven", seeing itself as a "re-founding" of the older University of Leuven. This claim to continuity with the older institution was not recognised at law, with Belgium's highest court ruling that the two institutions were different foundations. 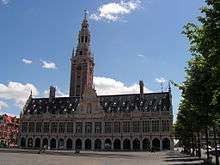 Nonetheless, the Catholic University of Leuven is very frequently identified as a continuation of the older institution. Université catholique de Louvain, French-speaking, situated primarily in nearby Louvain-la-Neuve. This entry deals with the historic university/universities, 1425–1797 and 1834–1968. For the current successor institutions and their separate development since 1968, see the individual articles linked above. In the 15th century the city of Leuven, with the support of John IV, Duke of Brabant, made a formal request to the Holy See for a university. Pope Martin V issued a papal bull dated 9 December 1425 founding the University in Leuven as a Studium Generale. In its early years, the university was modelled on those of Paris, Cologne and Vienna. The university flourished in the 16th century due to the presence of famous scholars and professors, such as Adriaan Florenszoon Boeyens (Pope Adrian VI), Desiderius Erasmus, Johannes Molanus, Joan Lluís Vives, Andreas Vesalius, Ferdinand Verbiest and Gerardus Mercator. After the French Revolutionary Wars, by the Treaty of Campo Formio, this region was ceded to the French Republic by Austria in exchange for the Republic of Venice. Once formally integrated into the French Republic, a law from 1793 which mandated that all universities in France be closed came into effect. The University of Leuven was abolished by decree of the Département of Dijle on October 25, 1797. The region next became part of the United Kingdom of the Netherlands (1815–1830), and William I of the Netherlands founded a new university in 1816 in Leuven as a state university (Dutch: Rijksuniversiteit). In 1830, Belgium was formed as a new nation out of the Southern Provinces of the Netherlands. Belgian bishops founded a new Roman Catholic university in 1834, at Mechelen. In 1835 the recently founded Catholic University of Mechlin moved to Leuven, and changed its name to Catholic University of Leuven, where the State University had been closed. This is nowadays generally seen as a refounding of the old University of Leuven, although the Belgian Court of Cassation has ruled that the two entities are legally distinct, and at the time, Liberals protested the attempts of the new Catholic university to usurp the heritage and identity of the historical University of Leuven. In 1914, during World War I, Leuven was looted by German troops. They set fire to a large part of the city, effectively destroying about half of it. The library was lost, as well as about 300,000 books, about 1000 incunabula; and a huge collection of manuscripts, such as the Easter Island tablet bearing Rongorongo text E. In the early stages of the war, Allied propaganda capitalized on the German destruction as a reflection on German Kultur. From its beginning in 1834, the Catholic University of Louvain provided lectures only in French. Latin was sometimes used in the theology faculty, but it was essentially a French-language institution. Lectures in Dutch, the other official language of Belgium and the language spoken in Leuven, began to be provided in 1930. In 1962, in line with constitutional reforms governing official language use, the French and Dutch sections of the university became autonomous within a common governing structure. Flemish nationalists continued to demand a division of the university, and Dutch speakers expressed resentment at privileges given to French-speaking academic staff and the perceived disdain by the local French-speaking community for their Dutch-speaking neighbours. At the time, Brussels and Leuven were both part of the officially bilingual and now defunct Province of Brabant; but unlike Brussels, Leuven had retained its Dutch-speaking character. Tensions rose when a French-speaking social geographer suggested in a televised lecture that the city of Leuven should be incorporated into an enlarged bilingual 'Greater-Brussels' region. Mainstream Flemish politicians and students began demonstrating under the slogan 'Leuven Vlaams - Walen Buiten' ("Leuven [is] Flemish - Walloons out"). Student demonstrations escalated into violence throughout the mid-60s. Student unrest fueled by the history of discrimination against Flemings eventually brought down the Belgian government in February 1968. The dispute was resolved in June 1968 by turning the Dutch-language section of the university into the independent Katholieke Universiteit Leuven, which remained in Leuven. The French-speaking university, called the Université catholique de Louvain, was moved to a greenfield campus called Louvain-la-Neuve ("New Leuven"), farther south in the French-speaking part of the Province of Brabant. Acrimony about the split was long-lasting. Nowadays, however, research collaborations and student exchanges between the two "sister universities" take place with increasing frequency. The ruins of the library of the Catholic University of Leuven after the library was burned by the German army in 1914. The holdings of the modern Catholic University of Leuven date back to 1834. Its main collections were held in a building on Naamsestraat dating back to the 17th century. It should be noted that it was only the collections of the university since its refounding that were lost. The manuscripts and most valuable works of the pre-revolutionary Old University, were transported to the National Library in Paris, while the bulk of the holdings (at least officially) was transferred to the Central School of Brussels, the official legal successor of the Old University of Leuven. The library of the Central School of Brussels had about 80,000 volumes, which then became part of the library of Brussels, and then the future Royal Library of Belgium where they are still found. The extensive archives of the Old University are now part of the State Archives in Belgium. The library building designed by Whitney Warren and built from 1921–1928, now the KUL's central library. Following the destruction of the library, a new library building was constructed on the Mgr. Ladeuzeplein. It was designed by the American architect Whitney Warren in a neo-Flemish-Renaissance style, and built between 1921 and 1928. Its monumental size is a reflection of the Allied victory against Germany, and it is one of the largest university buildings in the city. The library's collections were rebuilt with donations from all around the world, outraged by the barbaric act which it had suffered. In 1940, during the second German invasion of Leuven, the building largely burnt down, including its 900,000 manuscripts and books. The blaze is thought to have started in an exchange of fire between the two armies, rather than a deliberate act. The building was rebuilt after the war in accordance with Warren's design. The library's collections were again restored after the war, and by the fission in 1968 had approximately four million books. The split of the university into separate French-language and Dutch-language institutions in 1968 entailed a division of the central library holdings. This was done on the basis of alternate shelfmarks (except in cases where a work clearly belonged to one section or the other, e.g. was written by a member of faculty or bequeathed by an alumnus whose linguistic allegiance was clear). This gave rise to the factoid that encyclopedias and runs of periodicals were divided by volume between the two universities, but actually such series bear single shelfmarks. The building on the Mgr. Ladeuzeplein is now the central library of the Katholieke Universiteit Leuven. For post-1968 alumni, see Katholieke Universiteit Leuven or Université catholique de Louvain. Jan Standonck (1454–1504), priest and reformer, Master of the Collège de Montaigu in Paris. Adriaan Floriszoon Boeyens (1459–1523), Pope Adrian VI. Andreas Vesalius (1514–1564), father of modern anatomy. Cornelius Otto Jansen (1585–1638), father of Jansenism. Charles Nerinckx (1761–1824), founder of Sisters of Loretto. Bernard du Bus de Gisignies (1808–1874), law, politician, ornithologist and paleontologist. Hippoliet Van Peene (1811–1864), physician and playwright, wrote the lyrics of the Flemish anthem "De Vlaamse Leeuw"
Antanas Baranauskas (1835–1902), Lithuanian poet. Arthur Vierendeel (1852–1940) civil engineer. Emile Joseph Dillon (1854–1933), linguist, author and journalist. Charles Jean de la Vallée-Poussin (1866–1962), mathematician who proved the prime number theorem. Edgar Sengier (1879–1963), director of the Union Minière du Haut Katanga. Frans Van Cauwelaert (1880–1961), politician. Jean-Baptiste Janssens, S.J. (1889–1964), twenty-seventh Superior General of the Society of Jesus. Weng Wenhao (1889–1971), founder of modern Chinese geography. Georges Lemaître (1894–1966), astronomer, priest and proposer of the Big Bang theory. Fulton J. Sheen (1895–1979), American archbishop, television personality, and writer. * August De Boodt (1895 - 1986), politician. Jerome D'Souza, S.J. (1897–1977), educationist, member of Indian Constituent assembly, & four times Indian Delegate to the UNO. Saint Alberto Hurtado, (1901–1952), Chilean Jesuit priest, social worker and writer. Canonized in 2005. Victor Delhez, (1902–1985), engraver and artist. Hendrik Elias, (1902–1973), Flemish Nationalist, quisling. Maurice Anthony Biot (1905–1985), Belgian-American physicist and the founder of the theory of poroelasticity. Léon Degrelle, (1906–1994), founder of Rexism, quisling. Jean Charles Snoy et d'Oppuers (1907–1991), law, diplomat, businessman. Herman Van Breda (1911–1974), founder of the Husserl Archives. André Molitor (1911–2005), law, private secretary of Baudouin I of Belgium. Otto von Habsburg (1912–2011), heir to the thrones of Austria-Hungary; politician and writer. Qian Xiuling (1912–2008), saved nearly 100 lives during World War II. Tang Yuhan, (1912–2014), Chinese oncologist. Pieter De Somer (1917–1985), first rector of the Katholieke Universiteit Leuven. Christian de Duve (1917 - 2013), Nobel Prize in Medicine 1974, for his discoveries concerning the structural and functional organization of the cell. Anton van Wilderode (1919–1998), Flemish activist and writer. Frans Van Coetsem (1919–2002), linguist. Aster Berkhof, (1920– ), Flemish writer. Malachi Martin (1921–1999), Irish writer. Antoon Vergote, also known as Antoine Vergote (1921–2013), Catholic priest, theologian, philosopher, psychologist and psychoanalyst. Tomás Ó Fiaich (1923–1990), Archbishop of Armagh. Paul Byttebier (1923 - 2016), medical doctor and politician. Jan Zaprudnik (1924 - ), Belarusian-American historian and poet. Geza Vermes (1924–2013), religious historian and translator into English of the Dead Sea Scrolls. H. Narayan Murthy (1924–2011), Indian Psychologist, Philosopher and Scholar known for Behavioural Therapy. Gustavo Gutiérrez (1928 - ), Peruvian Dominican theologian, founder of Liberation Theology. Camilo Torres (1929–1966), Colombian priest and guerillero. Luce Irigaray (1930 - ), French philosopher, linguist, psycholinguist, psychoanalyst, cultural theorist, feminist. Graduated in 1954. Father Robert S. Smith (1932–2010), American Catholic priest, author, and educator. Herman Van Den Berghe (1933 - ), founder of the Centrum voor Menselijke Erfelijkheid (Belgian Centre for Human Heredity). Thomas Kanza (1933–2004), one of the first Congolese university graduates, Congolese ambassador to the United Nations. Pierre Laconte (1934 - ), a Belgian urbanist. André Goffeau (1935 - ), scientist participated to the yeast's DNA code discovery. Abdul Qadeer Khan (1936 - ), Pakistani metallurgist considered to be the father of Pakistan's nuclear weapons program. Jacques van Ypersele de Strihou (1936 - ), private secretary of the King of Belgium. Renato Prada Oropeza (1937 - 2011), Mexican writer and semiotician. Nguza Karl-i-Bond (1938–2003), notable Zairian politician. Baron Piet Van Waeyenberge (1938 - ), economics, President of De Warande. Erik De Clercq (1941 - ), physician and biologist. Bernard Lietaer (1942 - ), economist and author. Arthur Ulens (1946 - ), chemistry and economics, businessman. Herman Van Rompuy (1947 - ), Belgian statesman and Prime Minister of Belgium. Appointed as the first President of the European Council in November 2009. Wikimedia Commons has media related to Catholic University of Leuven (1834-1968). ↑ "About K.U.Leuven". Katholieke Universiteit Leuven. September 21, 2009. Retrieved July 18, 2010. ↑ Several rulings of the Belgian Courts, of Cassation and Appel, forbid the identification of the Catholic University with the Old University: "L'université catholique de Louvain ne peut être considérée comme continuant l'ancienne université de Louvain; et lorsqu'un acte de fondation a désigné pour collateur un professeur de cette ancienne université, il y a lieu d'y pourvoir par le gouvernement", (Table générale alphabétique et chronologique de la Pasicrisie Belge contenant la jurisprudence du Royaume de 1814 à 1850, Bruxelles, 1855, p. 585, colonne 1, alinea 2. Voir également: Bulletin Usuel des Lois et Arrêtés, 1861, p.166.) See also the ruling of the Cour d'Appel of 1844: La Belgique Judiciaire, 28 july 1844 n° 69, p. 1 : "Cour d’Appel de Bruxelles. Deuxième chambre. L'université libre de Louvain ne représente pas légalement l’antique université de cette ville. Attendu que cette université (l’ancienne Université de Louvain), instituée par une bulle papale, de concert avec l'autorité souveraine, formait un corps reconnu dans l'État, ayant différentes attributions, dont plusieurs même lui étaient déléguées par le pouvoir civil; Attendu que ce corps a été supprimé par les lois de la république française; Attendu que l'université existant actuellement à Louvain ne peut être considérée comme continuant celle qui existait en 1457, ces deux établissemens ayant un caractère bien distinct, puisque l'université actuelle, non reconnue comme personne civile, n'est qu'un établissement tout-à-fait privé, résultat de la liberté d'enseignement , en dehors de toute action du pouvoir et sans autorité dans l'État...". 1 2 3 Herbermann, Charles, ed. (1913). "University of Leuven". Catholic Encyclopedia. New York: Robert Appleton Company. ↑ Jan Roegiers et al., Leuven University, Leuven, Leuven University Press, 1990, p. 31: "With the Law of 3 Brumaire of Year IV, which reorganized higher education in the French Republic, there was no place for the University of Louvain, and it was abolished by Decree of the Departement of the Dijle on 25 octobre (1797)". ↑ (French) Maurice Voituron, Le parti libéral joué par le parti catholique dans la question de l'enseignement supérieur, Brussels, 1850: "et alors aurait paru plus évidente encore aux yeux du pays l'intention du parti catholique de tuer l'enseignement de l'État, afin de ne laisser debout que l'Université catholique de Malines, qui allait prendre le titre d'Université de Louvain, pour y usurper la renommée de l'ancienne, ainsi que ses fondations de bourses. Cependant, malgré lui, le parti catholique laissa échapper cet espoir par la bouche de son rapporteur M. Dechamps, lorsqu'il disait: "la confiance entourera de telle façon les établissements privés que les Universités de l'État,par exemple, deviendront à peu près désertes"
↑ Leuven University, p. 31: "The university colleges were closed on 9 november 1797, and all items of use, with all the books, were requisitioned for the new École Centrale, in Brussels"
↑ Jan van Impe (20 November 2012). De Leuvense universiteitsbibliotheek / druk 2: historische wandelgids. Leuven University Press. p. 26. ISBN 978-90-5867-920-8. Retrieved 29 June 2013. ↑ "Father Michael Hurley dies aged 87". RTÉ News and Current Affairs. 2011-04-16. Retrieved 2011-05-14.